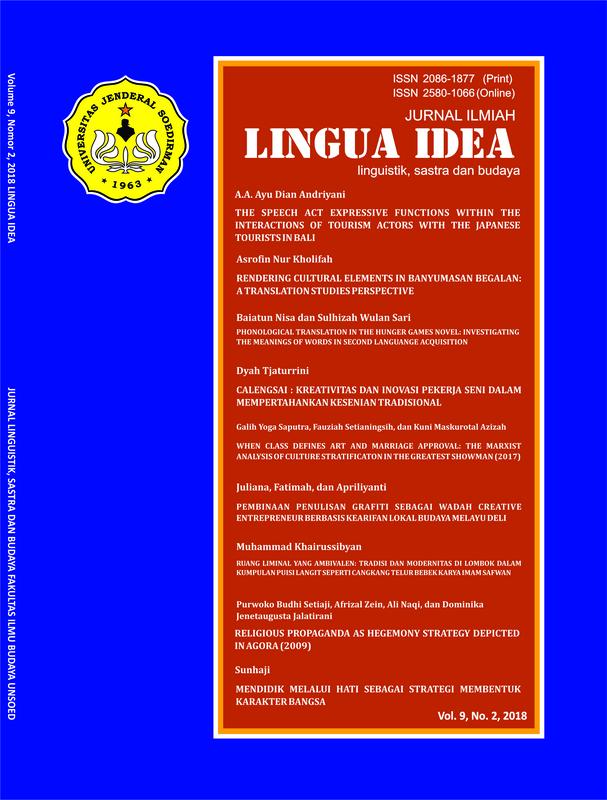 Jurnal Ilmiah Lingua Idea ( ISSN: 2580-1066 (online) - ISSN: 2086-1877 (print)) is a peer-reviewed journal, published by Faculty of Humanities Universitas Jenderal Soedirman Purwokerto. It is an open access journal that can be accessed freely to support a greater knowledege exchange and sharing. This journal applies double-blind peer review, which means the reviewer and the author identities are concealed each other during the review process. Issued twice a year, Jurnal Lingua Ideaprovides a forum that deals with discussion on language, culture and literature studies.